Positive hiring trends continued in February with employers adding workers for the 17th consecutive month. Strong private-sector job growth propelled the recovery, encouraging workers to enter the labor force, while the prolonged government employment contraction appears to be coming to an end. The gradual recovery of the domestic economy has built some momentum, but mixed news on the global front has reinforced lingering uncertainty. The recent restructuring of Greek debt temporarily eased eurozone concerns, but Middle East tensions continue to weigh on perception. These factors, together with questions spawned by the election year, will reinforce cautionary tendencies in U.S. corporations, but appear unlikely to derail a sustainable recovery. Private-sector employers added 233,000 workers in February, while the government shed 6,000 positions, yielding a net gain of 227,000 jobs last month. In addition, strong positive revisions were made to the December and January employment figures, adding a combined 61,000 jobs for those two months. Last month, professional and business services expanded by 82,000 workers, including 46,000 positions in temporary services, but many of the temporary positions could become permanent as the recovery gains steam. Leisure and hospitality added 44,000 workers, mostly at bars and restaurants, while education and health services created 71,000 new posts. Most of the gain in education and health services occurred in the medical field, where practices added 61,000 positions to support increased patient volume resulting from the restoration of healthcare benefits to the newly employed. 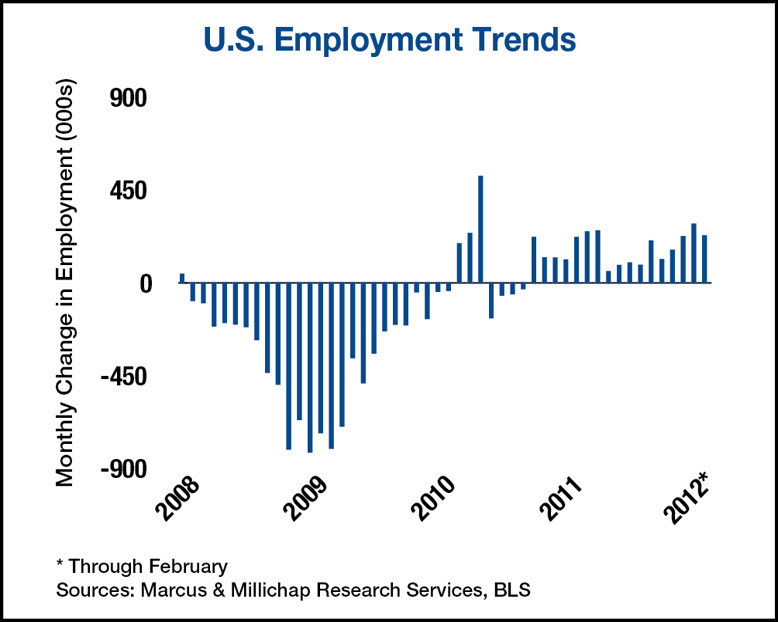 Combined, the broad-based hiring offers a generally positive outlook for the employment market, with year-to-date additions totaling 511,000. This strong start to the year could prove the current forecast of 2.2 million hires in 2012 to be a bit conservative. The unemployment rate held steady at 8.3 percent last month as nearly one million additional workers have entered the labor force so far this year. Since hiring moved into positive territory 23 months ago, 3.5 million positions have been created, but an additional 5.3 million positions must be filled to restore employment to late 2007 levels. Ongoing job growth will fuel continued, albeit limited, improvement to the national office sector. The addition of 42,000 full-time, office-using positions last month, and 415,000 jobs over the past year, is enabling employers to backfill unused desks and cubicles that linger as reminders of the recession. New, expanded space needs will continue to emerge as 2012 progresses and generate nearly 47 million square feet of net absorption during the year, reducing nationwide vacancy fall 70 basis points to 16.6 percent. Nearly 41,000 positions were added at bars and restaurants last month, raising the number of jobs created over the past year to 305,000. Openings of new restaurants and the addition of breakfast service at many national chains account for a portion of the increase, but many establishments also added staff to handle heavier customer volume. Bars and restaurants generate traffic at shopping centers, which likely contributed to a 30-basis-point decline in national retail vacancy last year. Vacancy will fall another 50 basis points in 2012 to 9.2 percent. This entry was written by marcusmillichap, posted on March 14, 2012 at 7:30 pm, filed under Research and tagged Employment. Bookmark the permalink. Follow any comments here with the RSS feed for this post. Post a comment or leave a trackback: Trackback URL. Hi there, You’ve got carried out an incredible occupation. I’ll unquestionably delicious them along with this element highly recommend for you to my buddies. I’m self-confident they shall be taken advantage of this blog.